We have compiled a list of external accredited partners who can offer a wide variety of design services for the ecommerce and regular templates. Please contact them with a full list of requirements and as much background information as possible. We do offer a number of design related services ourselves, these are listed on our store tools page - please get in touch if you need further information. Since 2012 Gary Flack has specialised in building "Ecommerce Templates" websites integrated with "ZURB Foundation", one of the most advanced and well recognised responsive frameworks in the world today. Fast Australian web hosting, domain name registration, SSL certificate installation, payment gateway and MailChimp configuration, Facebook integration and website update services are all available from IT ZAP. If you have little experience in HTML, PHP and CSS coding, and have no time or no interest in learning, well IT ZAP Website Design Works is definitely who you should contact. Here I take care of all that advanced coding and appearance styling to meet your satisfaction. Magic Slideshow, Font Awesome Icons and the responsive mmenu are all extra features included. Your website menu and the first 10 pages will be entered for you, ready to launch. All that is left for you to do is Login and begin entering more pages and uploading photos as you like, whenever you like. No page limits and no monthly fees, which is what makes Ecommerce Templates such a great way to go ! IT ZAP will configure your content management system especially to suit the purposes of your Small Business or Community Club, not just to promote Products and Services, but also Club Events and even Articles. NO, you do not need WordPress for that. IT ZAP provide an exclusive solution that allows you to enter Articles directly into Ecommerce Templates, with appropriate rich snippets for search engine optimization. Here the mobile friendly web design phase is just the beginning, not the end ! Being able to update your website regularly is very important. IT ZAP take you that extra step further and help you learn with "Making YOU The Webmaster" video demonstrations and articles. Technical support is only ever one telephone call or email message away. TwoDogs Design build websites that are user friendly, easy to navigate, professional and fully web standards compliant. All our sites are built bespoke from a customer brief using ideas and requests from our clients and are available to view throughout the build. We take the need to build a site fully compliant with the latest web standards very seriously as this helps with Search Engine Optimisation and having an amazing site which isn't seen by anyone due to poor, or old coding (using tables etc.) is a pointless, and possibly expensive mistake. Based in the South West UK, we have many years of experience and have found ECT the best off-the-shelf ecommerce package by far with excellent features, ease of use, excellent support and great value for money – couple that with bespoke designs and years of marketing and sales experience and we think we are worth a call to discuss your web & graphic requirements. If you're after a website that offers you all the benefits of an open source solution with the functionality of a shopping cart, then Ecommerce Templates powered by WordPress is the best choice for your online store. At FinSEO we specialize in developing small to medium business websites using WordPress and can get your website up and running quickly and affordably. Let us take the confusion out of developing a website that fits your business needs by calling FinSEO today! Since 1999, CENLYT Productions ms-designs has been providing affordable website design and related services. If you are looking for a custom built website, a re-design, or modifications to a template or exiting website, Cenlyt makes sure your website is compliant with all modern HTML and CSS standards and is mobile friendly. Whether your website is for personal use, business/e-commerce use, governmental use, Cenlyt can make it happen. Visit our Client and Screen Shots page to see some of the ECT stores we have done. 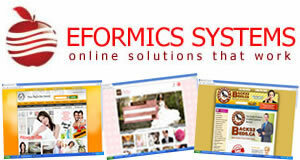 Eformics Systems is providing Web based IT Solutions since 2003. We specialize in customization and optimization of ECT shopping cart. Our focus is to serve affordable and professional web solutions to small and mid-sized businesses globally. We are a team of experienced programmers, graphic designers, Flash animators and business application consultants. Our cumulative experience in the IT Industry spans over 15 years of web related services including website designing, web application development, domain name registration, web hosting, mobile phone application, Facebook Fan Page application development, and many more web products. Whether you are looking for professional website designs, quality web hosting, a business email hosting solution, or just want to ensure your domain name is registered, we have a solution for you. Choosing us as your web service provider means you only need to deal with one party for all your online needs. No more running around between web designers, hosting companies and domain registration. We are accountable for all your services and as a result, can give you better quality control and quicker service delivery. We have accomplished several E-Commerce (ECT) projects and we would like you to check out our portfolio to find out how we can implement your ideas into a reality.